Amar Mondal does not belong to a traditional Gombhira pala lineage. Inspired by the few performances he saw while in his teens by the handful of teams that existed at the time, he decided to start writing sketches for Gombhira pala and performing at local functions. Amar is 58 years old now and has been composing and performing for about 25 years. Over time, he built a team, Anwesha Sanskritik Mancha - which is the only Gombhira group which has three office going members - that is, people who have received an education. The rest of the members of his group and indeed that of other groups are mostly cultivators or daily wage earners. Amar himself is employed as Executive Assistant of the Gram Panchayat of Peerganj village in Rotua II block. Most of the other teams are peopled with traditional performers. Amar has written a book called Apni Gombhira Ki Korey Shikben? which means How do you learn Gombhira. He is currently looking for a publisher. 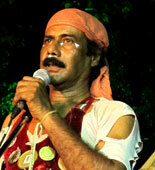 Amar feels that though there is some interest among the younger generation in performing Gombhira pala, their limited knowledge of traditional folklore and texts, interspersed with current affairs stands in the way of their composing witty, satirical sketches that would interest the thinking public.